You may be frustrated, feeling helpless and ready to give up. It’s not your fault. You are not the cause of our suffering, you may find that difficult to believe because we lash out at you, switch from being loving and kind to non trusting, nasty & unbearable, we may even blame you from time to time, but it’s not your fault. You deserve to understand about this condition, what we wish we could say, but we may not be ready. It is possible that something that you said or did ‘triggered us’ A ‘trigger’ is something that sets off in our mind, A post traumatic event maybe or something that causes us to have distressing thoughts. While you can attempt to be sensitive with the things you say and do, that’s not always possible and it’s not always clear why something sets off a trigger. The Mind is very complex, A certain song, sound, smell or words, can quickly fire of neurological connections that brings us back to a place where we didn’t feel safe and we may respond now with a similar reaction. (think of a military person who fights in combat – a simple backfiring of a car can send them into flashbacks This is known as PTSD (Post Traumatic Stress Disorder) This can happen a lot too us too. But Please know at the very same time we are pushing you away with our words or behaviour, We also desperately hope you will not leave us in our time of desperation and despair. This is Extreme ‘black and white thinking’ (Black and white thinking is when someone is only able to see the extremes of a situation, and is unable to see the “gray areas” or complexities of the situation) We will learn how to deal with this in therapy, but until then we may not have the proper tools to tell you this or ask for help and support. We may do very dramatic things, such as harm ourselves in some way (or threatening to do so) going to hospital or something similar, While these cries for help should be taken seriously, we understand that you may feel worn out from worrying about us and our repeated behaviour. Please trust us. With professional help, and despite what you may have heard or read or have come to believe, we CAN and we DO get better. These episodes get father and fewer between and we can experience long periods of stability and regulation of our emotions. sometimes the best you can do if you can muster up the strength in the frustration and hurt is to grab us, hug us and tell us that you love us and are not leaving. One of the Symptoms of BPD is intense fear of being abandoned and we therefore (often unconsciously) sometimes behave in extreme, frantic ways to avoid this happening, even our perception that abandonment is going to happen can because us to become frantic. Another thing that you may find confusing is our apparent inability to maintain relationships. We may jump from one friend to another, going from loving and idolising them to despising them- deleting their numbers and un-friending them on Facebook. We may avoid you, not answer your calls and decline invitations to be around you- and other times, all we want to do is be around you. This is called ‘Splitting’ its another part of the disorder, sometimes we make the first move in order to protect ourselves, by disowning people before they can reject or abandon us. Were not saying its ‘right’ We can work through this destructive pattern and learn how to be healthier when it comes to maintaining relationships. It doesn’t come naturally to us, it WILL take a lot of time and effort. Its difficult, after all, to relate to others properly when you don’t have a solid understanding of yourself and who you are. In BPD many of us experience identity disturbance issues, we may take on attributes of people around us, trying to find out who WE really are. sometimes we may even take on mannerisms of other people, We are one way at work, another at home, another with friends, this is how we got our nicknames as Chamelions.Some people work differently at home and work anyway, but you may not recognise us from the way we are at work to the way we are at home. it’s THAT extreme. For some of us, in Childhood we experienced times with parents, caregiver, or other grown ups who could suddenly switch from caring or loving to abusive. We had to behave in ways that would please the caregiver at any given moment to stay safe and survive. We havent outgrown this. Because of all this pain, we often experience feelings of emptiness. its smart for us to stay busy and distract ourselves when boredom starts to come on. On the other side of the coin, we might have outbursts of anger that can be scary. its important that we stay safe. It’s important that we do not hurt you or ourselves. This is just another manifestation of BPD. Through Therapy we can learn how to regulate our emotions, so that we do not become out of control. We can learn ho to stop sabotaging our lives and circumstances. And we can learnt to behave in ways that are worrying or hurtful to you. Another thing you may notice, is the spaced out look on our faces, this is called ‘dissociation’. Our brains literally disconnect and our thoughts go somewhere else, as our brains are trying to protect us from additional emotional trauma. We can learn grounding exercises and apply our skills to help during these episodes and they may become less frequent as we get better. Remember that your words, love and support go a long way with helping your loved one to heal,even if the results are not immediately evident. Not all the situations described apply to all people with BPD, a Person must only have 5 symptoms of 9 to be diagnosed, and the combinations of symptoms are seemingly endless. This post will just give you a typical understanding of BPD. My Hope is that you will gain insight into your loved ones condition, grow in compassion and understand for both your loved one AND yourself. This is not an easy road but it CAN and WILL get better. Do NOT read the negative BPD forums or BPD hate forums, unfortunately there are people out there that don’t understand and are not willing to try. I would refrain from taking to going to these forums and bashing someone based on their mental health diagnosis. WE ARE NOT MONSTERS. Everyone of us is doing our best with the tools that we have. 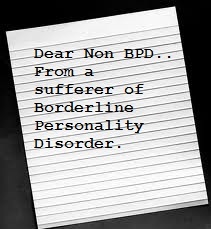 Previous Post What is BPD (Borderline Personality Disorder) ? That is very interesting name I haven’t heard suggested. It’s very applicable. I’m constantly blaming & attacking when I hit a BPD episode. The name I resonate with more, however, is emotional disregulation disorder. When the emotions come on, they are so strong that I am overwhelmed.